open cloud security virus - please HELP! I have this open cloud virus﻿ and run norton 360. It will not detect or remove the virus. I pretty computer savvy so I joined this forum looking for help. I have linked one of the sites I found with information about open cloud virus. After researching I learned that symantec owns spyware doctor which is the most popular program I have found mentioned on most of the sites to remove this infection. Re: open cloud security virus - please HELP! How are you determining that you have Open Cloud? Or you can find the file OpenCloud Security.exe﻿ and rename it to say bad.exe and restart the PC, now the registry can't find the file due to the renaming so the FakeAV doesn'r load, allowing for easier cleanup. Where do I find the opencloud.exe? From your Start Menu, select "Search." Choose "All Files and Folders," then type (or Copy/Paste) "OpenCloud" in the box for "All or part of the file name:"
When you find it, you can right click it and rename it as Quads suggests. Then reboot your PC and apply the cleaner of your choice, by the sound of it. Malwarebytes has a free tool that plays well with Norton; Norton Power Eraser is also available here, but should only be used if something like malwarebytes doesn't do the trick (which, if I'm reading Quads' post correctly, seems unnlikely--especially once you've renamed the .exe)...because Power Eraser scans very aggressively, and is more likely to mark files for removal that you'd actually want to keep. I have found the FakeAV "Open Cloud Security" to infect my PC with soon. This FakeAV when running blocks .exe, .com and .pif file types (of the ones I tried) that includes files / programs that are not security related and YES it blocks NPE (Norton Power Eraser). I will state locations etc, where I can. Restart the PC and select Safe Mode (Minimal) via the Advanced Menu during the restart, usually F8. Log in to the same account that you would have done in Normal Mode and have Safe Mode go though and load all the way to the Desktop. Select theToolsmenu and clickFolder Options. After the new window appears select theViewtab. Put a checkmark in the checkbox labeledDisplay the contents of system folders. Under theHidden files and folderssection select the radio button labeledShow hidden files and folders. Remove the checkmark from the checkbox labeledHide file extensions for known file types. Remove the checkmark from the checkbox labeledHide protected operating system files. Press theApply button and then theOKbutton and shutdown My Computer. ﻿Close all programs so that you are at your desktop. Click on theControl Panelmenu option. When the control panel opens click on theAppearance and Personalizationlink. Under the Folder Options category, click onShow Hidden Files or Folders. Under theHidden files and folderssection select the radio button labeledShow hidden files, folders, or drives. Remove the checkmark from the checkbox labeledHide extensions for known file types. Remove the checkmark from the checkbox labeledHide protected operating system files (Recommended). Press theApply button and then theOKbutton..
example, C:\Documents and Settings\John\Application Data\Open Cloud Antivirus\OpenCloud Security.exe﻿﻿"
Now Rename the file OpenCloud Security.exe﻿﻿﻿﻿ to like bad.exe by right clicking the file and selecting Rename. Here is a screenshot below showing the file in the folder. The resolution etc. shown in the screenshot is because I am in Safe Mode. After Renaming the file to say bad.exe you can now Restart the PC back into Normal Mode and the FakeAV doesn't load. Programs like Malwarebyes and Superantispyware can now be installed, updated defintions and run a Full scan to clean the infection up. c:\documents and settings\John\application data\open cloud antivirus (Rogue.OpenCloudAV) -> No action taken. c:\documents and settings\John\start menu\Programs\open cloud antivirus (Rogue.OpenCloudAV) -> No action taken. 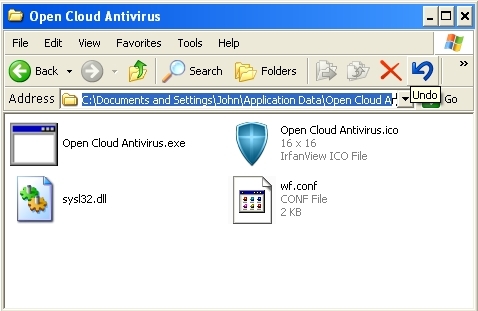 c:\documents and settings\John\application data\open cloud antivirus\wf.conf (Rogue.OpenCloudAV) -> No action taken. c:\documents and settings\John\application data\open cloud antivirus\bad.exe (Rogue.OpenCloudAV) -> No action taken. c:\documents and settings\John\application data\open cloud antivirus\open cloud antivirus.ico (Rogue.OpenCloudAV) -> No action taken. c:\documents and settings\John\application data\open cloud antivirus\sysl32.dll (Rogue.OpenCloudAV) -> No action taken. c:\documents and settings\John\start menu\Programs\open cloud antivirus\open cloud antivirus.lnk (Rogue.OpenCloudAV) -> No action taken. Haven't done Superantispyware Free yet. I had the Open Cloud AV as well. I'm not saying this will work for everyone, but I started up my computer in Safe Mode (F8 during boot up) and simply did a "system restore" to a point in time previous to acquiring that virus. It worked. System restore can damage a lot of other apps. It is best to follow Quads's instructions to the letter. You damaged the fake AV so that it is no longer active, but a system restore might not clear all the files. Believe it or not but it took me longer to write out the above post (message) than it was for me to figure out how to disable the FakeAV. With System Restore there are a few programs that have problems afterwards, I think Norton with the Virus Definitions are one. You need to show hidden files and folders, the file for a new variant may be a different name but in the same location. I have been able to run Hijackthis and Malwarebytes with the FakeAV (OpenCloud Security /Antivirus) running at the time. The FakeAV allows files named iexplore.exe to run as it thinks that is Internet Explorer, so in fact fooling it. You do have to make sure that in the Folder Options (see previous instructions) the Hide file extensions for known file types﻿ is unticked / unchecked, because if the user has it selected to not see the extension (.exe) and the user renames the file by typing iexplore.exe in actual fact you will end up with iexplore.exe.exe which will be blocked. I used the executable version of Hijackthis which does not have to be installed but run from the Desktop, after at some point remaning hijackthis.exe to iexplore.exe. Hijackthis will now run. You are to go to the Main Menu then the Open Misc. the tools Section from there select Open Process Manager, this will list running processes, which then allows you to select and kil the FakeAV process, which is also shown in the screenshot. You are then able to install, update and run a Full scan no problems. I also tried the technique to run Malwarebytes and Superantispyware Free. Malwarebytes, you just have to rename the installer package iexplore.exe, install Malwarebytes then go into the Malwarebytes Program folder (eg. C:\Program Files\Malwarebytes' Anti-Malware﻿\mbam.exe) and rename mbam.exe to iexplore.exe and then just run the renamed file. c:\documents and settings\John\application data\open cloud antivirus\open cloud antivirus.exe (Backdoor.Bot) -> 532 -> Unloaded process successfully. Don't worry about Superantispyware as it didn't detect anything for it. Yeah thats exactly what I see Popping up! Open cloud Security program. I found out its a virus. I want to thank everyone for all their help! I could not get the malwarebytes program to work. Every time I went to their site it sent me to cnet and for soome reason I could only download a program called ARO. I'm not sure why malwarebytes would do that. It was not easy to remove. I had to call the phone number they have on their site several times to get help and finally got open cloud removed. Again, I want to thank everyone that posted in here trying to help me! Malwarebytes does not provide a download on their own site. They redirect to CNET. That is where you would have obtained the installation package. There are now two new names for this FakeAV family, AV Guard Online﻿ and Security Guard 2012﻿ but both removal ways by me above still work, except the file names are now [random]. Also I will say this here so other forums know, saves me getting PM's, It's OK to use my instructions, either of them, for anyone on the web, who is trying to remove the family of FakeAV or someone trying to help someone remove there infection. It is not a Virus, It is a FakeAV (Rogue) and is easier then some nasties I have battled in the past. The path for this family of FakeAV's has changed, In trying AV Guard Online the .exe is named as random characters but is also now located in the system32 folder. It has a Run Registry entry for loading the .exe but that means the file won't load in Safe Mode. I decided to try the iexplore.exe trick a go and here is a screenshot below. (I have overlapped the 3 programs to make the screenshot smaller while still having the writing readable). Open the Image / Screenshot in a new Tab to see it at full size. In the Hijackthis process list its the last 3 entries we are looking at. The first is the FakeAV (AV Guard Online) process running from the system32 folder. The second is Malwarebytes renamed to iexplore.exe and running. The third is Hijackthis remaned to iexplore.exe and running from the Desktop. c:\WINDOWS\system32\uibbff3png5a.exe (Backdoor.Bot) -> 1956 -> No action taken. HKEY_LOCAL_MACHINE\SOFTWARE\Microsoft\Windows\CurrentVersion\Run\m66ddWK8fRZ9TXj8234A (Backdoor.Bot) -> Value: m66ddWK8fRZ9TXj8234A -> No action taken. I have managed to get passed the AV Guard Online family of FakeAV and Zeroaccess that is running in the background at the same time. It going to be fairly long instructions to come. "Every time i run a scan it goes for about ten seconds and then shuts off﻿" That sounds like zeroaccess in the background, as it doesn't matter what you name the security program file, even iexplore.exe, zeroaccess is not as dumb as the FakeAV and still knows it's a security program and thus kills it. Can you find the file taskmgr.exe in the system32 folder?? Quads will be along in a bit Porcupine123. It isn't quite 7 AM where he is. the only problem is that i am literally heading out of town in an hour. is there anyone that can help me? Quads is the Ace here, when it comes to the really dangerous stuff like rootkits. In his absence--given your time constraints--you might try the recommended forums, where a real malware expert can work with you one-on-one in real time to dig these things out. Some of our best folks here have checked them out to make sure that they are capable, and competent to deal with rootkits and other nasties. Most of them handle tricky Windows problems as well. I hope that it's not too close to your departure for this to do some good. Best of luck, and please let us know how it turns out! i don't know if i have even time for that. if i turn off my computer for the next two weeks and tackle the problem when i come back is that any more dangerous? does the virus do anything while the computer is shut down? please someone respond asap thanks! The infection doesn't do anything when the computer is turned off. Have you done the folder options step so that you see hidden files and folders and known file extensions?? I did this in Normal Mode (not Safe Mode) with zeroaccess also installed in the background. In Normal Mode you will find the FakeAV will always popup with warnings and trying to get you to buy it. this gets annoying during the breaking process but keep closing the window or clicking "No Thanks" "Continue unprotected" etc. With taskmgr.exe, right click the file and select Copy from the menu. Then say on the desktop right click and select Paste. Now you have a taskmgr.exe on the desktop. Now right click the Desktop copy and rename the file iexplore.exe. 1. The file taskmgr.exe is not a security program so that if the PC has zeroaccess as well it does not get blocked by the tripwire, zeroaccess allows it through. 2. Renaming taskmgr.exe to iexplore.exe for the desktop copy also means the FakeAV family in question also allows it through so doesn't block it either. Remember I did this in Normal Mode, but here is a screenshot after clicking and running the desktop copy. 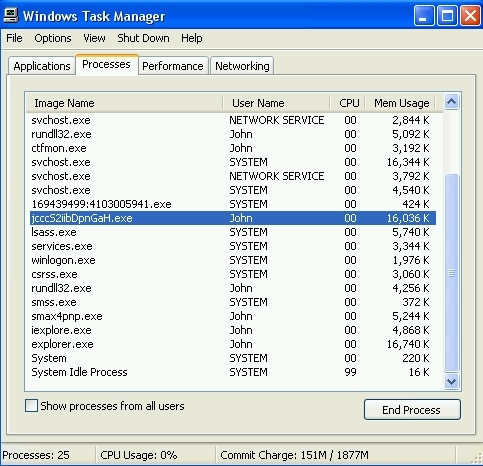 iexplore.exe, This is the running Task Manager renamed. 169439....:4103..... This is my copy of Zeroaccess showing in the list, there is nothing that can be done about this one at this point. Hopefully the user returns in two weeks. This isn't really something that can be done in 15 minutes on a forum. I have used Norton 360, but it was incompatible with my college's wifi, and started using the UAHuntsville provided McAffee. Then last week I got hit with the OpenCloud virus. I muddled through trying to use the Mcaffee software, then after a while I got frustrated and hit it with a system restore. Today I got the popups again, did a search or two, then hit it with System Restore again. I also just re-installed Norton, because the IT dept at school claims 360 should work now, and I never had any trouble with it, and I use it on my other computers. My questions... Does System Restore remove all traces of the virus? Was the recurrence due to reinfection? Do I need to go through msconfig to check? PS - I hope Norton and the other AV makers understand that this kind of malware is more destructive and time consuming than any simple virus. I found the FakeAV family on it's own simple, The FakeAV family and zeroaccess a bit more YUM, but still reasonably easy to break apart in to steps. People that have tried alsorts and everything apart from the kitchen sink can make things worse as really they don't really know what is going on and so can screw things. A FakeAV and zeroaccess are not viruses. May not be viruses - but they do about as much damage. Is it true that the current Open Cloud has a trojan with it that is not easily removed? That was the party line on Malwarebytes. Well you can use the Malwarebytes Forum instead then could you not, as they know about it. I used System Restore before I found this site. Right afterward, I downloaded the latest Norton 360, and cleaned my registry, ran a full system scan. Should that take care of the fakeAV? The FakeAVs, by themselves, are "scareware" -- basically digital protection rackets designed to get you to pay them to stop telling you you have all these infections you never really had in the first place. They're annoying, but as Quads says relatively straightforward to remove. I am not a malware expert, but I'm confident I could get rid of these with the instructions he's already posted on other threads here if I needed to. Zeroaccess is a rootkit. Rootkits often come "bundled" with other malware, and function to protect it, hiding it from your Operating System, interfering with any security software you might have installed, and often preventing you from visiting the big security software websites or downloading their products. Zeroaccess is particularly dangerous because it contains a tripwire, which brings everything to a grinding halt if your security software does find it. If you have the rootkit, System Restores, Norton, MacAfee, Malwarebytes, and the like are NOT going to rid you of it. You're going to need expert help. Here, that would be Quads. There are other forums that can help you with this also, where a real malware expert can work with you one-on-one in real time to dig these things out. Some of our best folks here have checked them out to make sure that they are capable, and competent to deal with rootkits and other nasties. Most of them handle tricky Windows problems as well. Sounds like good advice from DisEd2. I have been following this and similar threads for a while. They clearly show the problems that can be caused by the FakeAV family and zeroaccess﻿. I am also pleased to say the forum seems to show how to get around them, but with time and care. My question is - how do I avoid getting them in the first place? Should Norton 360 (up to date) keep me safe or do I need to do anything else? A lot of scareware, like less dangerous (but often equally annoying) PUPs, gets installed by the user, by clicking on a Web ad for what is presented as free or inexpensive security trialware. So our FIRST line of defense is practicing safe browsing/computing habits. For most, having Norton 360 as our SECOND line of defense will be adequate. You absolutely SHOULDN'T install a second REAL-TIME security product, as these programs tend to conflict and perceive each others scans as intrusion attempts. And in over twenty years, I haven't found anything better in this role than Norton. For those desiring a THIRD layer of defense, however, a good NON-real-time product like the FREE VERSION of malwarebytes is an effective, compatible product. Norton Power Eraser is also solid in this role, but scans very aggressively and is somewhat prone to flagging files you may actually WANT as targets for deletion. Finally, it's important to recognize that no solution is 100%, if only because of zero-day threats that no one has encountered before. For THESE, the final layer in your effective defense is forums like this, where true experts like Quads can work with you to get down into your Operating System and pull the little nasties out by their roots. Several other forums like this also exist, which you may have seen me link elsewhere. A layered defense is the best defense, because it has no single point of failure. Thanks for your comprehensive reply DistEd2. However I remain unclear, if I inadvertently click on a bad link which harbours some of the FakeAV family and/or zeroaccess﻿, will Norton 360 alert me in this case? I find the best protection is Firefox with the NoScript add-on. NoScript prevents any scripts from running. I checked a bad webpage for a user with Firefox and again with Internet Explorer. There was a malicious toolkit on the page but was only apparent using IE. Scripts are difficult for antivirus to block because of the need for Java and similar apps. Zeroaccess is particularly dangerous because it contains a tripwire, which brings everything to a grinding halt if your security software does find it. If it found it, yes. And there may be earlier versions without the tripwire; I don't recall for sure. I am not a malware expert, so if you think you may have a live infection that Norton 360, malwarebytes, and Norton power Eraser are not finding or successfully extracting, it is best to refer you to the recommended forums, where a real malware expert can work with you one-on-one in real time to dig these things out. Some of our best folks here have checked them out to make sure that they are capable, and competent to deal with rootkits and other nasties. Most of them handle tricky Windows problems as well. SPELNDID; delighted to hear it! Will keep you in my prayers a few more days, just in case! This is a forum for Norton products, Not AVG they have there own. 1. Unless you missed to write one down in the list the FakeAV is not running, and you do have zeroaccess. Since you are using AVG, your post should be on the Tech Outpost forum. The Mods have been advised. Hang in while it gets moved.